We are TUBETEST SERVICE & SUPPLY (1978) Ltd., a well-known Oilfield Service company. We manufacture and operate as a service, Tubular Pressure Testing units, bringing to you the same testing efficiency that has won TUBETEST worldwide recognition over the past four decades. This patented HYDRO-TEST method, pressure tests tubing in its made up position while running in the hole, thereby eliminating any leaks in the thread make-up or pipe wall. With experience gained over the four decades of operations worldwide, we offer a wide range of products and services. We offer everything from OFFSHORE TUBULAR PRESSURE TESTING units, POWER THREAD CLEANERS, GLUTTON SANDLINE BAILERS to MANUFACTURING of HYDRO-TEST EQUIPMENT. Trust Tubetest to handle all of your service and supply needs. Everything Tubetest has, they had developed. These products are used in Russia, the middle East, North Sea, and extensively used in North America. The first test unit was developed in 1951. Jack Bush was the original designer of Tubetest. Mitch Sullivan and partner had purchased the company in 1960. The U.S. operation called Hydro Test is manufactured and shipped from the U.S. There are only two systems in the world: the Bar Type tool and Hydro Test. 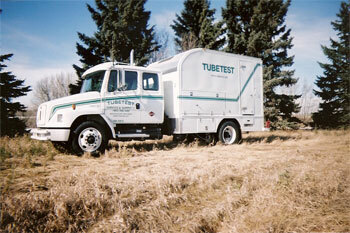 All patents and rights are owned by Tubetest, based in Red Deer, Alberta.